A client’s risk profile is the level of risk the client is willing to accept. As a successful financial advisor or financial consultant, assessing a client’s risk profile is a not-so-simple process of engaging the client in cost-benefit analysis. The client must decide how much he’s willing to pay for protection. 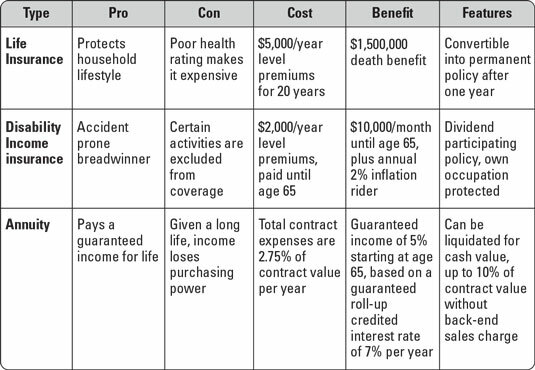 Everyone conducts this cost-benefit analysis when they buy any type of insurance. Many certification programs can provide you the formal knowledge of how and when to apply different solutions, but nothing can replace real-world experience. Evaluating a client’s appetite for big-ticket risks and finding the right products is more art than science. You’ll get better at it over time. In the meantime, the following approaches can get you started in the right direction. Death: How much income would be lost by the breadwinner’s death? How much would it cost to bury a family member? Health/illness: Do certain serious illnesses run in the family? Are certain family members at greater risk of physical injury and illness than others? What would happen to the family finances if someone in the family contracted a long-term illness? Job loss: What impact would a job loss have on the family finances? Does your client have sufficient savings to weather a job loss? Disability: If a breadwinner became disabled, what impact would that have on the family’s finances? Marriage/divorce: What would be the financial impact of a marriage or divorce? Family issues: If your client has one or more burdensome family members, what financial risks do they pose? For example, substance abuse interventions and treatments can be costly. Personal property: What if the family home were destroyed by fire, flood, or some other disaster? What if a vehicle were totaled? What if items of value were stolen? Business ownership: How would damage to or destruction of a business impact the family finances? What if a customer sued the business for damages? Your client may already have plans or insurance policies in place to cover losses in some or all of these areas. Your job at this point is to gain insight into how well he is positioned to deal with possible losses and to increase his awareness of what he stands to lose if certain tragic events occur. Don’t hesitate to pry into the lives of your clients. The financial fallout from an unplanned event is far more uncomfortable that the temporary awkwardness of discussing personal or family problems openly. Many times in my own financial advisory career, I’ve received a call from a client asking me to wire money to cover an anticipated liability that I didn’t know was even a possibility. Ask clients about their family and how everyone’s doing physically and mentally. Ask them how work is going and whether their family is dealing with any issues that you need to know about. Although you don’t want to grill your clients, you need to play detective and find out about any major events or situations that could rock their financial boat, such as a marriage, divorce, job loss, or illness. Check in with clients at least once a year to see if anything has changed. Assessing the client’s exposure to risk exercises your and your client’s intuition. Neither of you can see the future, but you and your client must consider the possibilities and the potential financial fallout. If your client truly trusts you and understands the relevance to your work, then you’ll be the keeper of many secrets, which is a humbling burden in this profession. Never break the trust or confidence your clients place in you. You want to be known as the financial advisor with integrity. PV economic loss is the present value of some future, possible, and/or probable liability in dollars. PV sum of all premiums paid is the amount of money paid over time into an insurance policy or contract or other strategy to protect against that specific future liability. PV of cash value accumulations is the accessible cash value that has accumulated in the insurance policy contract at some point in the future, if that feature is applicable. The equation shows that a possible loss would cost your client more than the total cost of having insurance to protect against that loss. If you wanted to get even more fancy, you could try to research the probability of your client experiencing a particular event, like death or disability. There’s just one small problem — no one believes it could happen to him, which makes the whole probability exercise futile with clients. where FV is future value, i is the discount rate, and n is the number of years. and so on to the 25th year, and then total all annual salaries to arrive at a total lifetime earnings of $10,972,902.40. Assuming a discount rate of 3 percent for inflation, the present value of $10,972,902.40 is $10,972,902.40 divided by (1 + .03)25 , which equals $5,240,719.30. Note that PV of cash accumulations isn’t applicable, because this is a term life insurance policy. Using cash value life policies can be a good way to build contract value, which reduces opportunity cost on the capital allocated to such a policy, as well as, the cumulative premiums paid. Insurance isn’t free, so people typically make trade-offs to reduce the cost. For example, Healthcare.gov offers four levels of health insurance — bronze, silver, gold, and platinum. A healthy 25-year-old man would probably opt for the bronze plan, in the belief (and hope) that he doesn’t contract a serious illness. Someone who’s older and has numerous health issues may be better off with a gold or platinum plan. Risk tolerance varies among clients. They don’t always need to hedge against a total loss or worst-case scenario. After you and your client agree on a monetary value of what a potential loss would be, the next step is to ask your client how much of that loss he’s willing to risk. The most conservative client will want to protect against 100 percent of the potential loss, whereas a client with much more tolerance and disconnection from risks may be interested in covering only 50 percent of a highly probable liability and opt for no coverage on what he considers a low probability loss. Clients’ decisions are influenced by several factors but mostly by how relevant they believe the risk is to them personally. You can’t read people’s minds, so try to get your clients to open up about how they feel regarding the risks and the costs of hedging against those risks. Only then can you offer the rational processes to help them make decisions that are in their long-term best interest. The insurance provider’s financial strength: You can whittle down the list of options by choosing to work only with the best of the best insurance providers. Financial strength is a good indication that the company has great management, offers great products, and will continue to grow and adapt. Check the insurance company’s Comdex rating to gain insight into its financial strength. Most insurance companies list this figure on their website, where they show all financial data. Also, as a licensed insurance broker, you’ll have access to this data through your brokerage group’s subscription to VitalSigns or EbixLife. Value: Compare the cost, coverage, and features of different plans to determine which plans offer the most for the money. Features are additional benefits; for example, some life insurance policies waive the premium if the client becomes seriously ill or disabled. Features can make or break an insurance policy, so don’t overlook their value. Flexibility: If you’re shopping for a life insurance policy, consider whether your client will be able to convert the policy or contract to another type of insurance; for example, he could convert a term policy to a permanent policy later. Find at least one low-cost, mid-range, and high-cost policy, so you can present the options to your client. If you conclude that a recommendation is worth giving, do so only after conducting your own competitive marketplace product analysis. If your firm favors and promotes a certain insurance carrier, that’s fine, but conduct your competitive analysis and recommend products that are truly in your client’s best interest. You can often address your client’s needs best with a blend of products. Consider using different types of insurance policies and contracts to produce the desired outcomes. Create a table to illustrate your liability management plan, as shown. For each solution you recommend, state your reasons for including that solution as an option and present its pros and cons or its cost, benefits, and features. Let your clients know that you have chosen only the best of the best insurance providers, and explain the importance of choosing products from companies that are in a financial position to back those products. A sample illustration of a liability management plan. Don’t use emotional coercion to manipulate a client into a product or strategy. Most clients sense when their arms are being twisted, and they’re more likely to reject your recommendation than embrace it. You can get your point across in ways that aren’t coercive. Several insurance-sales coaching programs are available to train advisors in techniques designed to connect clients with the gravity and emotion of potential life disasters, so clients are more receptive to insurance solutions. These approaches are effective because they increase clients’ awareness and understanding without being pushy. One approach to estimating how much life or disability insurance a client needs is to calculate the income the person would earn over the course of his life. A general rule in calculating coverage for losing a breadwinner’s income is to multiply the person’s annual salary by 20 years. If the person earns $150,000 per year, then $150,000 x 20 years = $3 million in today’s dollars paid as a lump sum. However, you should adjust for the ages of the surviving spouse and children, if any. With younger survivors, you may want to multiply the annual salary by 40. If the survivors are older, you may go as low as 10 times the salary. For example, suppose your client is a family of five. Mom’s a 32-year-old attorney earning $250,000/year married to a 28-year-old dad who stays at home and raises the kids. In the event of mom’s death or physical disability, the family would probably need $250,000 x 40 = $10 million to maintain their lifestyle and achieve their future financial goals. The family could decide that the premiums on a $10 million insurance policy are too expensive. They figure that in the event of mom’s death or disability, dad could get a job to offset the loss of income, they could scale down, and the kids would be able to take care of themselves in 15 years. They figure that they could probably get by on $100,000 per year, so they decide that $100,000 x 20 = $2 million of coverage would be sufficient. With a needs-based approach to estimating insurance coverage, you link the benefit payout to a future liability. For example, suppose your client wants to make sure his eight-year-old daughter’s college expenses are paid for in the event of his death. A simple $500,000 life insurance policy specifically timed to provide that coverage throughout the daughter’s college career would suffice here. To be precise, a $500,000 death benefit, 15-year term life policy would do the trick.